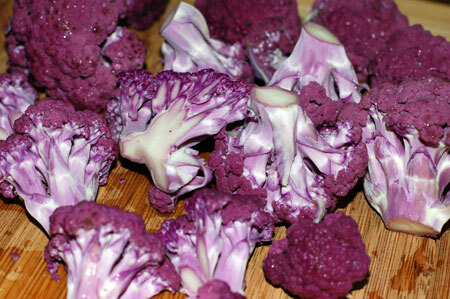 I couldn’t resist snatching up this purple cauliflower at Lifesource the other day, then did a little research to decide how best to go about cooking it. As good for you as the ordinary white brand of cauliflower is, the purple kind is even better: its color comes from anthocyanin, a flavanoid jam-packed with antioxidants. The catch is that anthocyanin is water-soluble, so boiling or steaming the vegetable would cause a portion of those benefits to end up down the drain, quite literally. Fortunately, my new favorite method for cooking cauliflower is entirely water-free. I’ve been using Lidia Bastianich’s recipe for skillet cauliflower to get that roasty caramelized flavor on the stovetop, and the only water in it comes from salting and covering the cauliflower as they cook: moisture is released from the vegetables themselves, so they steam just enough to soften up before browning. 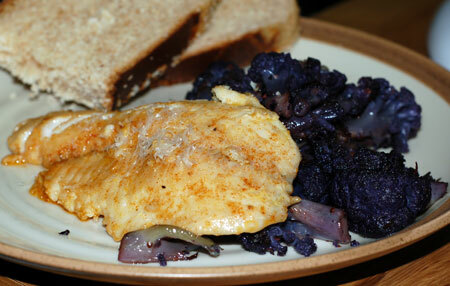 It was the perfect technique to seal in that beautiful amethyst color, and I served it alongside some pan-cooked tilapia simply seasoned with smoked paprika and garlic. Tear off the outer leaves of the cauliflower and core it, separating it into florets. Next, cut the florets into slices roughly 1/2″ thick. Heat the olive oil in a large skillet or saute pan over medium-low heat. Scatter the garlic slices and pepper flakes into the oil, and cover them with the cauliflower; sprinkle the salt over the florets, toss everything together well, and cover. Let the cauliflower sweat for about 4 minutes, shaking the pan occasionally, then toss thoroughly with a spoon. Cover, allow to cook for another 3 minutes or so, and toss again. The edges of the cauliflower should be starting to brown; if not, turn up the heat a little. Continue cooking in this fashion until the cauliflower is tender and beautifully caramelized, about 12-15 minutes total time. This is great information! 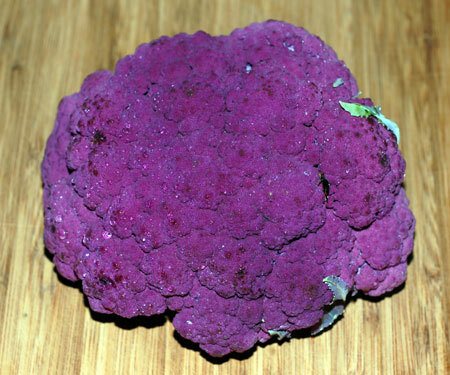 I bought a purple cauliflower and found your article searching for information about it. I linked Purple Cauliflower Eater to my blog. Your pictures are fantastic. I tried a version last night without the pepper flakes (to prevent heartburn). I had it over brown rice, using a 3-1 mixture of chicken stock and water, vs. just water. I also threw some cashew nuts in the skillet, and sprinkled some shredded sharp cheddar on top. Did I like it? The skillet’s heating up as I write!